Isn't Easter over Tori? Yeahh I know, I know. But guys, this was too quick and quirky not to share. I mean, one of the best parts of Easter are the sales on the candy after it has passed! Cheap candy is where it's at man. 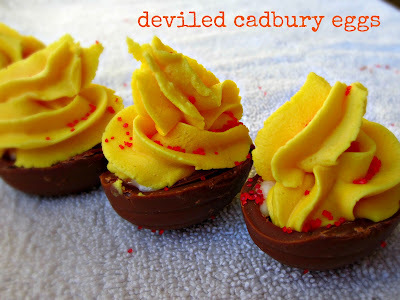 And I love Cadbury Creme Eggs. If they made these suckers year round I'd be a very chubby bunny (pun intended). I stumbled on this "deviled" creme egg idea on Pinterest. I don't like the normal deviled egg all that much so these were such a sweet play on the original I knew it was something I had to try. Plus it gave me an excuse to buy a massive amount of my favorite Easter candy. Score. These are super simple to make. Just make sure to have a really sharp knife when you're cutting the chocolate in half. I broke a few of my eggs because the knives in our house have seriously taken a beating. 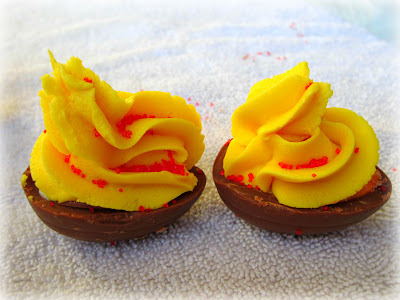 If done right, you have an adorable sweet treat that imitates something savory. Fun. 1. Remember to chill these in freezer for at least an hour. You want the fondant centers to be hard when you cut into them. 2. Using a very sharp knife, gently slice the eggs in half lengthwise, following the seam on the sides. The egg should separate pretty easily into two halves with a dollop of fondant on each half. Leave fondant in egg shell. 4. 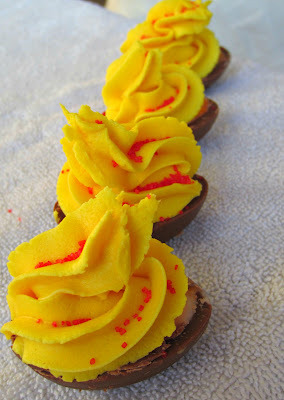 Sprinkle red sprinkles on top of the buttercream to give the appearance of paprika.